R.E.M. has hit that mark where their albums are becoming classics and thusly those albums warrant the re-mastered/reissued/reintroduced cycle experienced once the celebrated milestone years are reached. It seems then that record labels realize what they have and the marketing potential they can exploit. 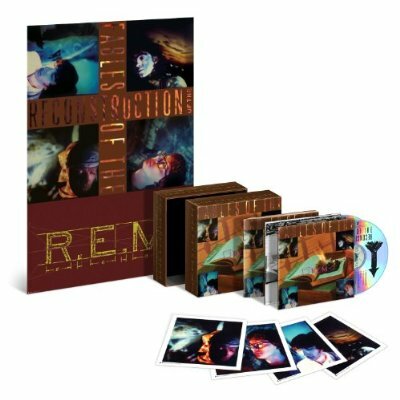 For R.E.M., the magic number is “25” and those avid fans of college radio, when Murmur and Reckoning were their steady diet between exams and keggers, will undoubtedly grab hold of these newly minted gems as manipulated and welcomed nostalgia takes hold. Both Murmur and Reckoning had their respective 25th birthdays recognized in 2008 and 2009 and now 1985’s Fables of the Reconstruction gets to blow out the candles in 2010. Packaged in a thick flip-top box, the new Fables is accompanied by a pretty comprehensive demo disc dubbed, “The Athens Demos.” There are also liner notes by guitarist Peter Buck, four square photo cards of the band members and a large foldout poster. It’s a rather ornate set for what could be considered a quiet release. To hear Fables, and to realize that very little the band has churned out since sounds much like it, one can appreciate why that impression could’ve come about. Buck does go on to say that the band was fatigued mentally and physically after having toured nonstop for four years. And, they were suffering through a winter in London, geared up to record an album with songs that were mostly unfinished. For their previous two albums, R.E.M. had worked with producers Mitch Easter and Don Dixon. Signaling a new creative stride, the band chose Joe Boyd, (Nick Drake, Fairport Convention), to produce Fables. Within the album’s first three glassy guitar notes, Buck’s introduction to “Feeling Gravity’s Pull,” a precedent for tension is set that experiences a couple moments of relaxation (“Can’t Get There From Here,” “Life And How To Live It”), but remains a reliable determinate for the album’s mood. “Maps and Legends” only follows with a slower and slightly more morose disposition, albeit with a beautiful guitar melody. Michael Stipe, sad or not, sounds natural here as he comes up with one of his more engaging vocals. “Driver 8,” with Buck essentially writing a version of the riff that would make Document’s “The One I Love” so captivating, was an obvious selection for a single. Its tempo punchy, its hook memorable, “Driver 8” is one of the album’s lighter moments, (“…we can reach our destination…”), though aware of futility and the ease of hopelessness, (“…but we’re still a ways away…”). For a single, “Driver 8” is clad in isolation and atypically honest as an assessment of the full album. Usually a singles market is based on how a song sounds on the radio; plays on video or seeps into the youth’s collective consciousness to generate revenue. “Driver 8” is one of the most upbeat downers of a single I’ve ever heard, even in a post-90s climate when misery and alienation were all the rage and “Shiny Happy People” seemed to go against the grain. Similar to “Driver 8” is “Auctioneer (Another Engine)” which also bases itself in this notion of escape and the futility of effort. Narrative and fast-paced, “Auctioneer” carries upbeat declaratives into melancholy hooks, (“Listen (listen) to the auctioneer, another engine, another engine…”). A single based more in the traditional sense, “Can’t Get There From Here,” has a big band kick, zippy bass line and radio-friendly energy. The song does breakaway from Fables’ drear, though Stipe’s delivery almost comes off as resignation. His tone works, though: the band’s instance of enthusiasm mostly allocated to the music. Also taking more of a speedy tone, “Life and How To Live It” embraces a familiar side of R.E.M., a “Radio Free Europe” aim and heightened groove at its forefront. But Fables of the Reconstruction, even in an attempt to vary up its tone, delivers “Old Man Kensey,” which is one of its more memorable and darkest offerings. “Old Man Kensey” is delivered as a list of ambitions; his obstacles and what is ultimately real, countering what the man wants do with why he can’t do it and what he has to do instead. As a narrative, whether it’s to be taken literally or not, it’s a pretty brilliant song, Mike Mills’ subtle background vocal only adding to the character’s heartache. 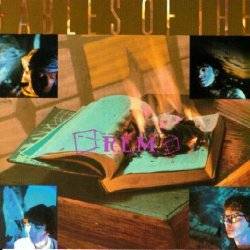 In a lot of instances the addition of outtakes and extras seems to serve as filler for commemorative sets like Fables,’ the type of material that rarely outdoes the final product, is sometimes un-listenable and seems to maybe stimulate interest enough for one spin before CD #2 stays housed in its jewel case, only to see the light of day when CD #1 is being pulled. “The Athens Demos,” though, serves as a somewhat unique accompaniment to the album, almost necessary to Fables’ formation. Hearing drummer Bill Berry expand on the tension of “Feeling Gravity’s Pull” with additional percussion almost drives the song to a darker and more frustrating place. I almost like this version better than the keeper. I feel the same way about the demo’d “Green Grow The Rushes Grow,” where Stipe seems more involved vocally, and “Kohoutek” which also seems to benefit from Berry’s unfiltered intervention. His drums are consistently stronger on the demo mixes. The other points of interest “The Athens Demos” CD hosts are a couple rarities, most notable of which is “Throw Those Trolls Away,” which up to this point has never seen the light of day. Other goodies are the demo version of “Bandwagon,” which was the B-side to “Can’t Get There From Here,” and “Hyena,” whose finalized self found a spot on Life’s Rich Pageant. Realizing that simply being 25 years old doesn’t always garner acknowledgement, respect or the honor of commemoration, while also realizing that Fables of the Reconstruction probably wasn’t that big of a deal when it first released, I’m happy that this album, out of any R.E.M. release, fits the bill. People don’t always get it right the first time and I think when a diversion has been made by a band that (in this case) evolved from their turmoil, it’s easy enough to miss the point or suffer from a lack of understanding that hindsight always seems to fix. R.E.M. deserves the credit they get, especially for their earliest contributions to indie music. But the emotional investment paid in this instance stands out, not so much to diminish the quality of their other albums, but definitely to prop this one up as revelatory and specific to this moment in the band’s history. If Fables of the Reconstruction should be acknowledged for any reason at all other than its years, it should be acknowledged as the time R.E.M. tried “malfunction” on for size. Once the album was finished, they tried on something else.